One of the blogs that I follow is Chris van der Heide's Algoma Central. His blog posts contain a wealth of information on Canadian railroading in the 1960's up through the mid-80's in addition to very in-depth research on the AC. He is also an incredibly talented modeler and scratch-builder. 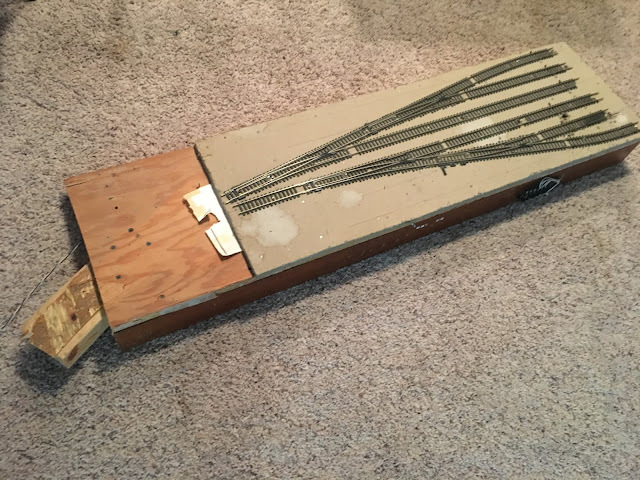 Some of his recent structure and freight car projects are just beautiful. 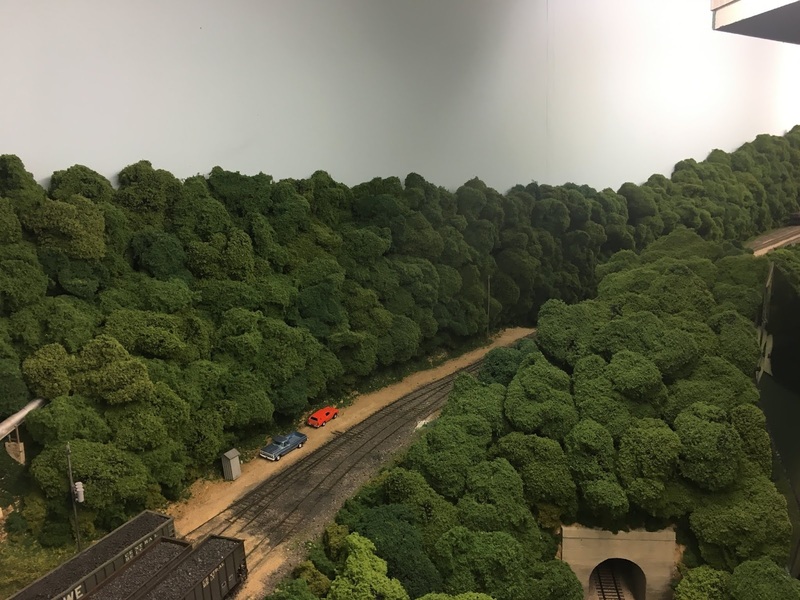 You can find a link to his blog in the Great Railroad Modeling Sites list to the right of this post. Last week, Chris posted about making a styrene strip sorting and storage rack. 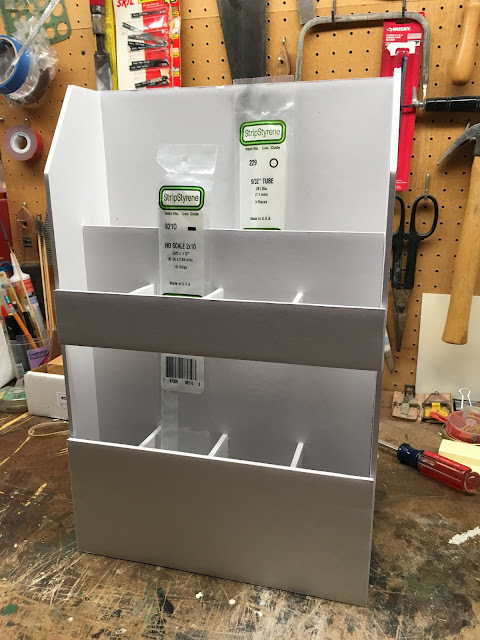 Here's a link to the post: http://vanderheide.ca/blog/2018/09/23/styrene-strip-sorting-and-storage-rack/. I have been struggling for years to keep my supply of styrene strips and brass wire organized and Chris' design looked like the perfect solution. Plus, I have never used foam core board for anything before and this project looked like a good chance to try it out. 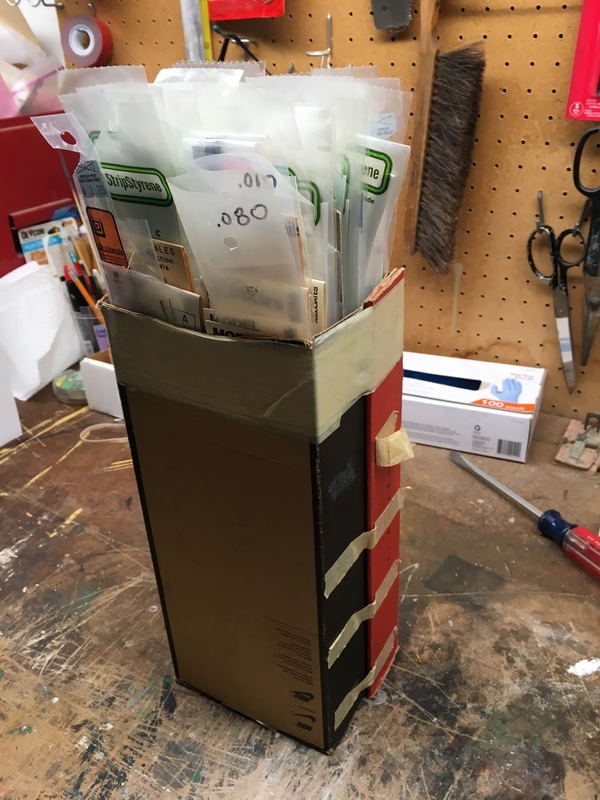 The photo below shows the modified shoe box that I have used for many years to store strip styrene and brass wire. While it doesn't look it, the strips are organized by size and part number. But as you can see, actually finding the part number and/or size requires a bit of searching. And the box is getting pretty full. 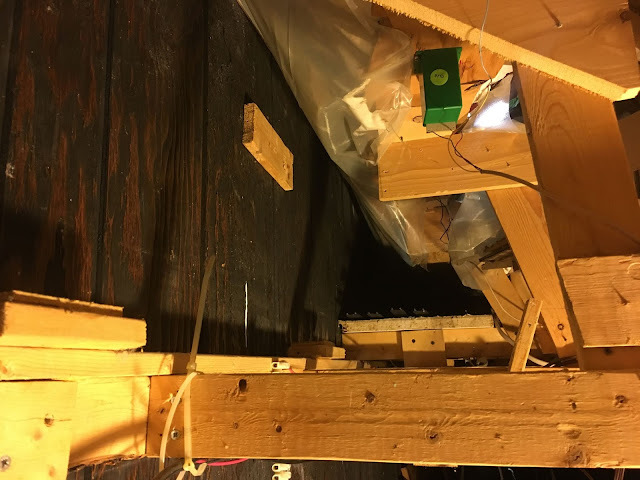 Chris provides the basic dimensions of the rack in his post and it's easy enough to come up with the rest based upon the size of the Evergreen packages. So after a little cutting and gluing with the foam core board, the new rack was ready to be placed in service! This was a fun little project and a nice diversion from wiring up LED's for the dispatcher's panel. And I know I'll be grateful the time I reach for some brass wire or strip styrene. So thanks, Chris, for the idea! Now that the summer is over, it's time to get the railroad ready for operating sessions again. I spent most of the summer working on various pieces of the dispatcher's panel and developing all new waybills. As a result, nothing much moved over the road in about three months. 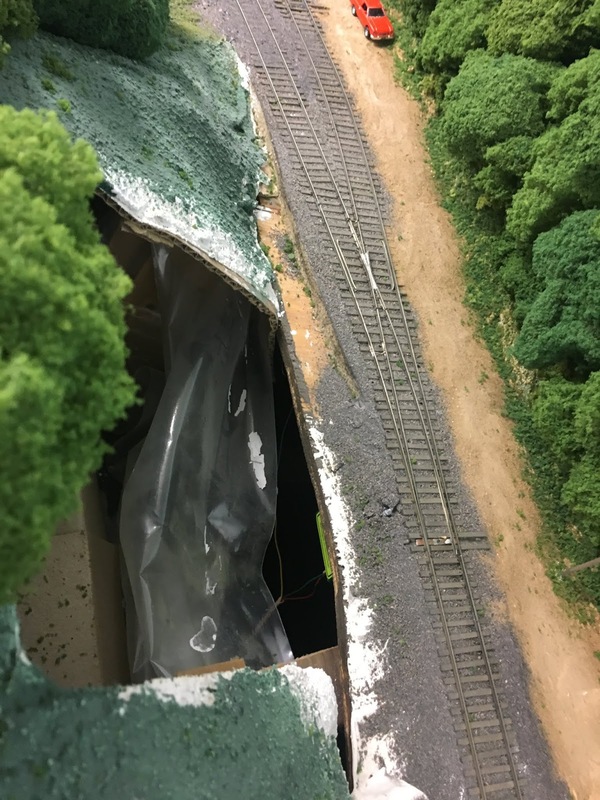 There were several small problems that cropped up over the summer, and it's time to fix those and thoroughly check the railroad prior to the next operating session. After firing up the railroad this morning, I heard a soft, humming sound over near the McHenry Coal Co. tipple at the end of the Sand Fork Branch. It appeared that one of the old Hankscraft switch motors had developed a problem of some sort. The photo below shows where the turnout that is controlled by this switch machine is located- it's next to the pole above the tunnel portal. Note the hill between the track and the aisle. Fortunately, there is access to this switch machine in the area shown in the photo below. Unfortunately, someone thought that this clever idea might actually allow a person to access the switch machine. Aside from the fact that the hole is behind the previously mentioned hill, there is simply no way to get to anything even remotely related to the switch machine. A quick check under the layout revealed the cursed, dreaded, abandoned west staging yard. And of course, it completely blocked any access to the switch machine in question. Sigh... This project was going to be much more difficult than I had originally imagined. After studying the throat to the abandoned yard, it appeared that I might be able to remove it. 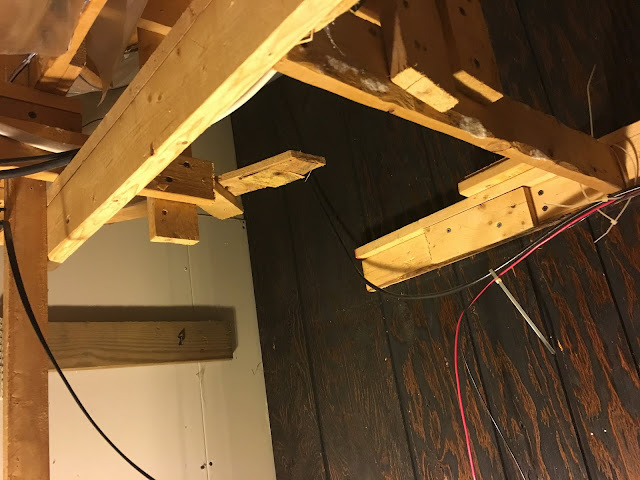 It wasn't physically connected to the yard itself, except for the track, and it looked like there were only a handful of screws holding it the benchwork. After much gnashing of teeth and a couple of skinned knuckles, I was successful. The photo below shows what was excavated from underneath the railroad. The next two photos show the site of the dig. Note the staging yard tracks in the lower third of the second photo.